Police allegedly beat up the Meerut woman for having a Muslim friend A Muslim man and his Hindu friend who was targeted by right-wing activists in Meerut on Sunday have accused police of misbehaving with them instead of trying to prevent the attackers from beating him up mercilessly. The man said he was accused by the group -- allegedly affiliated to the right-wing Vishwa Hindu Parishad -- of indulging in "love jihad", and repeatedly hit in his private parts. 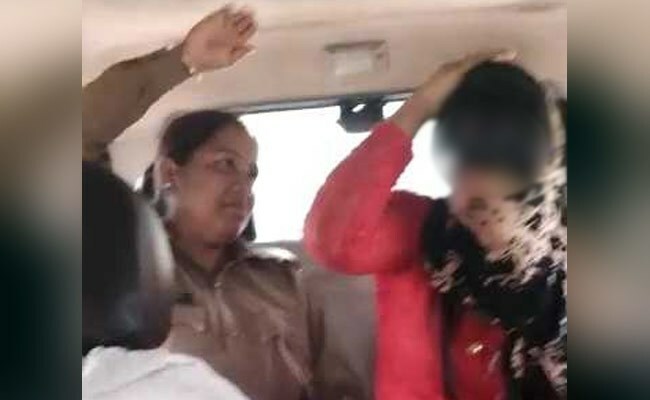 The girl claimed that she and her friend were studying in his home when “Bajrang Dal activists” locked her in a room and took the boy outside and started thrashing him. The matter came to light after a 50-second video of the incident turned up on the social media today. Their parents were called, and the girl’s father pressured to file a complaint against the Muslim man. The two students were allowed to return home only after the father refused to lodge a complaint.